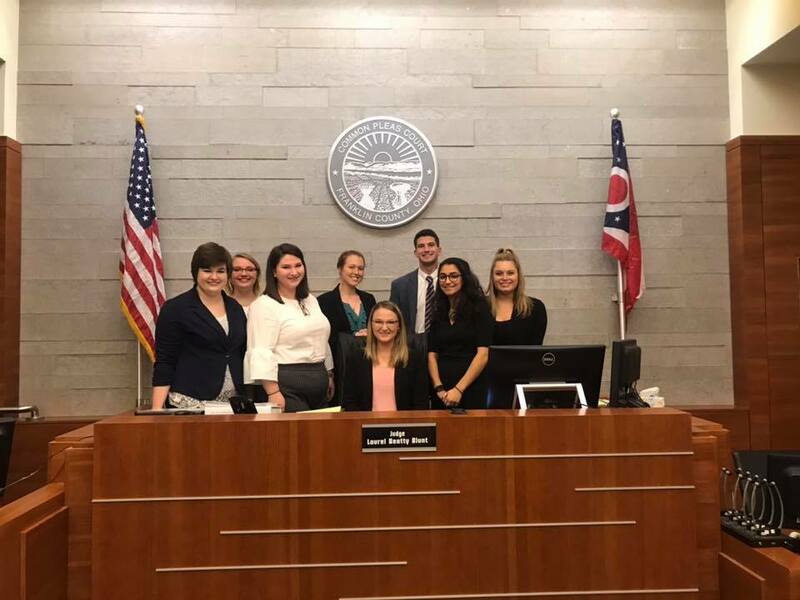 The Ohio University Mock Trial Team sent one team to the Franklin County Court of Common pleas to compete in the Ohio State University Scarlet and Gray Invitational. The competition took place on October 27-28. The members were divided into two sides: plaintiff and defense. Over the weekend, each side participated in two trials for a total of four rounds. Two judges, one of whom acted as the presiding judge throughout the trial, scored each trial. Members of the team were required to try out in early September. Students were asked to prepare a five-minute speech, and to be familiar with a witness statement. Finally, they were given an extemporaneous topic and three minutes to make an argument. Twenty-four students were selected to participate on the team during the 2018-2019 school year. Members were then assigned to roles as attorneys, witnesses, or both. Witnesses are responsible for being familiar with their respective affidavit or deposition, creating a character, as well as working with their attorney to prepare a direct examination and prepare for cross-examination. Attorneys are responsible for crafting opening and closing statements, being familiar with the rules of evidence to prepare for objections, and working with witnesses to practice both direct and cross examinations. The team competes under the umbrella of the American Mock Trial Association, which is made up of over 600 teams from 350 colleges and universities. The case this year involves a civil negligence suit and countersuit surrounding a chimpanzee attack during a pre-show rehearsal for a television show that resulted in the death of a writer, cancellation of the show, and the closing of an animal sanctuary. The Mock Trial Team is coached by Pre-Law Specialist Larry Hayman of the Ohio University Center for Law, Justice & Culture. A photo of the competing mock trial invitational team. From left: Gabrielle Tharp, Ellen Gill, Lillian Mattimoe, Kristin Tate, Taryn Osborne, Ryan Crowley, Amal Afyouni, Lydia Wendel.